If you’re planning to visit all 50 states, we have a proposition for you: save North Dakota for last. It’s not that we don’t want you to see our great state – believe us, we love visitors – but there’s something in it for you. We’ve started a Best for Last Club, an exclusive club created for those who saved the best state (that’s us!) for last on their great quest to visit all 50 states. Head to North Dakota’s eastern border and its largest city, Fargo. 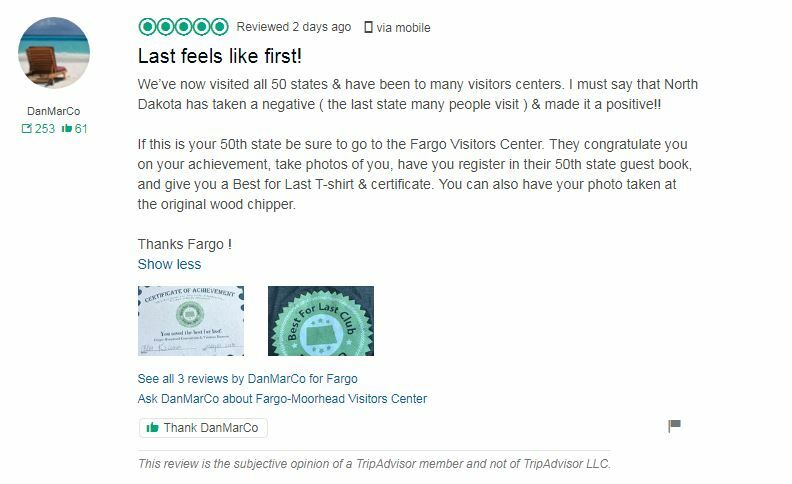 Once you arrive, stop by the Visitors Center and mention to one of the Travel Ambassadors that North Dakota is your 50th state. They’ll roll out the red carpet (and by that we mean, they’ll take your picture by our huge ‘Best for Last Club’ sign) and celebrate this huge accomplishment with you. As a new member, we’ll induct you into the club by having you sign our member book, and we’ll adorn you with official Best for Last Club swag to commemorate your achievement. We’ll also take your photo and post it in our album on Facebook, so we can boast about you online, too. What if I visited North Dakota, but didn’t make it to Fargo? That’s okay! Send us an email at info@fargomoorhead.org with your name, t-shirt size, and the date you visited North Dakota, and we’ll ship out your commemorative gear. 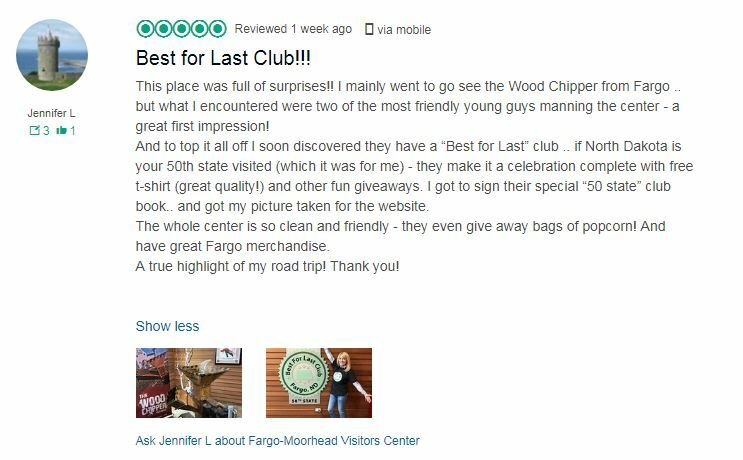 Celebrating all visitors to North Dakota is our aim, even if you didn’t manage to make it to Fargo (though we hope on a return trip, you will)! We love hearing the stories of how you reached us and the experiences you gained during your journeys. 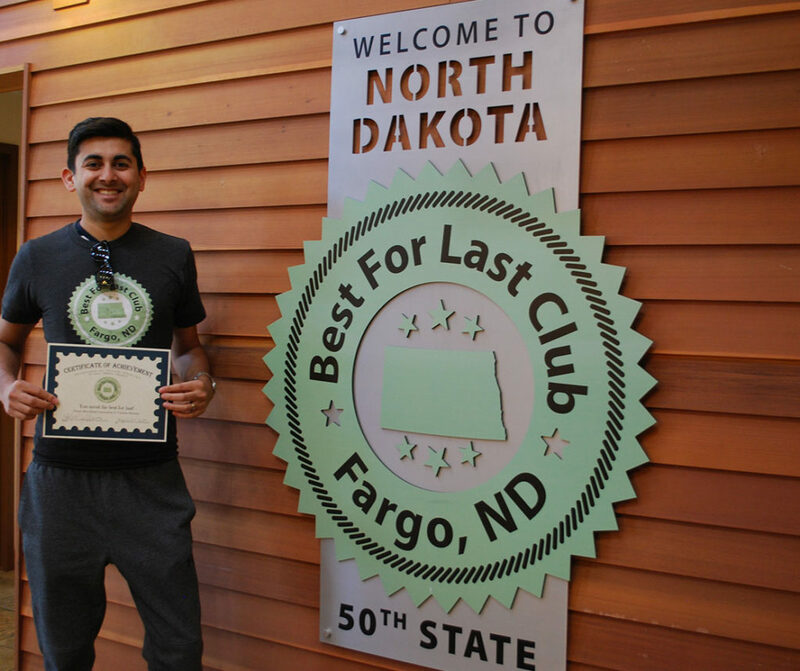 The Best for Last Club made the front page of The Wall Street Journal in September 2015. Since then, the club has continued to grow, reaching 1,000 members in 2016. This year, we’re closing in on 2,000! We hope you’ll be one of them. It’s a big deal to visit all 50 states, and you deserve to be recognized. For us, we get the reward of celebrating with you, seeing your excitement and welcoming you to what we feel is the best state of them all. So, if you or someone you know is nearing the completion of the route to all 50 states and North Dakota is one you haven’t crossed off yet, go ahead… save the Best for Last.